A car dealership should go beyond just selling you a car. They should be there to meet all your automotive needs, from helping you select the right make and model, to providing repairs and service if you ever need them. That is our philosophy here at Middletown Honda, and it is what our customers love about us. We provide a service, not just a product. If you are in the market for a great new or used vehicle, pay us a visit, and see what we have to offer. We are located at 520 Route 211 East in Middletown, right by the Gander Mountain. If you are coming from the Monroe area, you can drive north on US-6 and look for us off of exit 120. Our dealership is open seven days a week so you can shop for a vehicle on your own schedule. Come down Monday through Thursday from 7:30 a.m. to 7:00 p.m., Friday and Saturday from 9:00 a.m. to 6:00 p.m., or on Sunday from 10:00 a.m. to 4:00 p.m. If you need an auto loan, we make it easy. Just fill out our quick online application and wait to see what we can do for you. If you have poor credit, don’t worry, we are still prepared to offer you a loan. If you don’t feel like driving down here, browse our entire inventory online right from home. We offer the complete lineup of new Honda vehicles, as well as used vehicles from many of the top automakers. If you are looking for a car, truck, or SUV, start your search here. Our parts and service department is staffed by expert mechanics who are equipped to handle the complete range of automotive issues. From an oil change to an engine replacement, we can handle it all. If you ever need help with you vehicle, you can rely on us. The drive from Monroe takes less than 20 minutes, and you will be glad you let us meet all of you automotive needs. 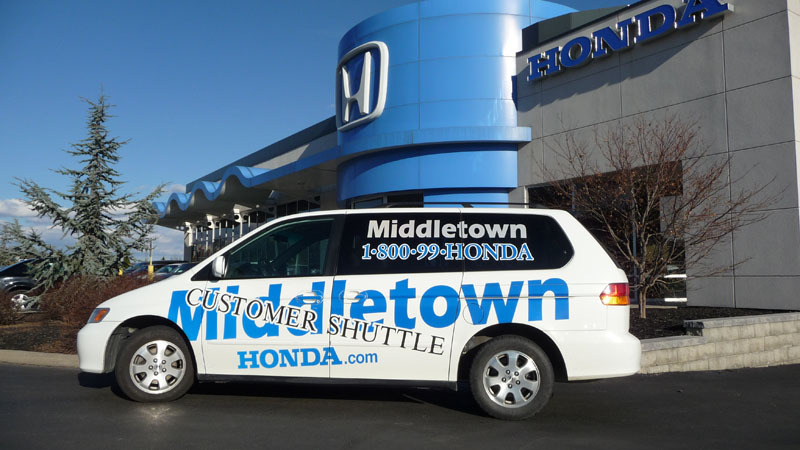 Visit Middletown Honda to experience a better kind of car dealership. You can reach us at (855) 473-3053 if you have any questions!